That doll stumbled on a word or two. It was cool how Marcella flipped the cubes around to change the scene. 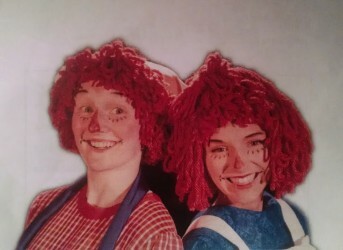 Theater Schmeater graciously offers Raggedy Ann and Andy as their “Free for the Family” play at the Volunteer Park amphitheater through July and early August (donations welcome). Written by Patricia Thackray and directed by Monica Wulzen, this one-hour show was the best outdoor children’s play my family has seen. Most importantly, the dialogue was easy to understand, even with airplanes flying over Capitol Hill. Each actor committed completely to their character, and the audience was spellbound. No errant sippy cups or distracted toddlers pulled my eye! I did suspect a few gregarious audience members of being planted to enliven the crowd. Either that, or some seriously demonstrative individuals happened to show up. Either way, it totally worked. I found myself gasping and whooping, realizing only afterward that I had lost my composure. I couldn’t resist, and that’s actually the reason I go to the theatre. So, good on ya, Theater Schmeater. The opening and scene changes were just a bit slow, mostly because the amphitheater stage is huge. Alex Sanchez’s character, Marcella, is the girl who owns the playroom, and she needed a long moment to skip across. She twirled the oversized alphabet blocks, revealing images that set the scene. The day before Marcella’s birthday, a new French doll showed up in the playroom as a gift, and the social order among the toys was thrown off. The doll dropped her precious hairbrush out the window, was kidnapped by Loonyland characters, and Raggedy Ann and Andy’s heroic mission was set. Their journey took them to Loonyland, the taffy factory and beyond, with Raggedy Ann’s kind candy heart and seam-popping brain at the center of the action. Lauren Huston and Charlie Schuster played Raggedy Ann and Andy as kind-hearted do-gooders: lovable, loose-limbed ragdolls. The new French doll, Babbette, played by Alysha Curry, was snooty and standoffish, sprinkling French words through her elite speech as she brushed her sausage curls. Aaron Allshouse added warmth and wisdom as the wooden Grandpa doll, then supplied a little distaste of something unkind as the greedy taffy man. His characters added depth and spurred on the plot. The ballerina and Prince Leonard, played by Devon Allen, were fun to watch. But seeing him as a male dancer in a ballet skirt and as a prince wearing a bridal veil in his wedding made me wonder about the director’s intention. The gender-bending images went right over my kids’ heads, and I now debate about such images in theatre: are they a healthy representation of diversity or just distracting because they break conventions? And just in case I don’t sound stuffy enough already, the actors’ supercool tattoos too drew attention away from the play. They were intriguing in themselves, but they referenced the actor rather than the character. Geb Brown was a howl as Lester the dragon and Whizzer, the assistant to the loony Prince Leonard. Gary Zinter’s Mechanico the robot and King Koo Koo added rich texture and zaniness. Mary Hould as the lost camel was adorable. But the camel was so singly worried and forlorn that it reminded me of that friend who talks about her problems All The Time. Note: when I read the previous sentence to my daughter, she elbowed me in the ribs, HARD. The Kids Loved The Camel. And I did too. I just thought she could use some antidepressants and a vision board. Kirsten Deane was riveting as Suzy the pincushion, Witch Wigglewart, and Princess Lucretia, the bride of Prince Leonard. I could not get enough of her electric, sensual voice and delicate embodiment of her characters. She was All In. She even delivered throwaway side dialogue with 100% commitment, yet theatrically small so it deferred to the characters in the spotlight. The actors in Raggedy Ann and Andy worked together beautifully. Never mind a few quirks. This fine play is a welcome gift from Theater Schmeater. Come to the party, blow out your candles, peel off the paper. The play presents a hilarious, inspiring story of helping others in need. My own kid couldn’t resist declaring, “Raggedy Ann is such a sweetheart. Literally!” And when the kids go from whining to punning, THAT is a happy family outing. Tickets: No ticket required, open lawn seating, donations accepted. Parking: Unpredictable. Can be a congested area. Some parking available in the park and on local side streets, but bus/bike/walk is reliably most efficient.